New owners who purchased a Charis Community Housing renovated home. “You need to understand the financial realities of bringing a supermarket to an area where discretionary income is not high,” explains Jim Wehner, Charis’ executive director. Much of a market’s profit is not from food but “extras” such as paper goods and magazines, which low-income residents may not easily afford. In the East Lake Community, the grocery chain Publix had to be talked into opening a branch. But today, over 12 years later, the store is doing well – a testament to the successful development efforts by Tom Cousins, Charis, and others in partnership with residents. Ultimately, once homes are fixed up and occupied, the residents themselves bring most of the revitalization, notes Jim. They build a sense of community, look out for one another, and band together to address issues affecting them. A recent example is a two-block stretch of 12 houses in South Atlanta. Eighteen months ago, just three were occupied. The vacant homes had been totally stripped of electrical wiring, plumbing fixtures, anything of value – leaving them open to drug deals and other crimes. Charis rehabbed three homes as affordable housing and three as market rate; two investors also bought homes (one as a Section 8 rental and one at market rate). 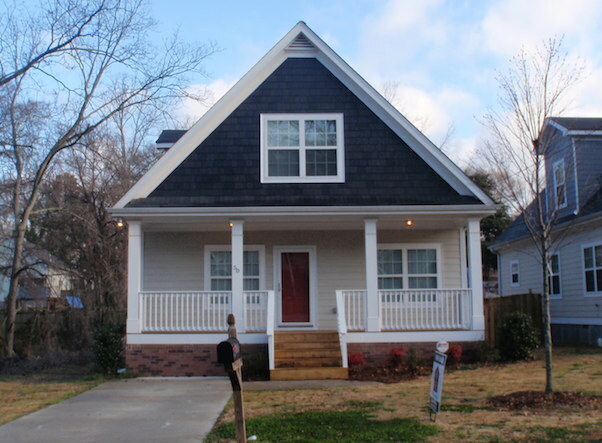 Charis is rehabbing damaged vacant properties into attractive homes that are revitalizing South Atlanta streets. For homeowners like Tracy and Mary Hancock, living in such a transformed neighborhood is a “dream come true.” Several years ago, the couple bought a house in Ormewood Park – one of the first communities where Charis worked. The path wasn’t easy, Tracy and Mary admit. Often, after working all day, they felt like skipping their evening homeownership classes. With ongoing encouragement from Charis staff members (who’d call to remind them before each class), they stuck it out. Now, they’re both so glad they did – and in fact, they’d like to see more classes in the future. The Hancocks love the economic and ethnic diversity of Ormewood Park. They’ve become active members of the neighborhood, helping with the community garden, cleanup days, and other activities. And Charis, they say, is the “goldmine” that has allowed them to “own a piece of the earth” in the “best part” of Atlanta. The story of how FCS Urban Ministries and Charis began is featured on pages 81-86 of Making Housing Happen. You can read an excerpt of the chapter here, and purchase the book from Wipf and Stock Publishers.